Spanning more than a century, every coin in this collection is minted of lustrous real silver. Each of the fifteen coins has been hand selected for historic significance and illustrious design. 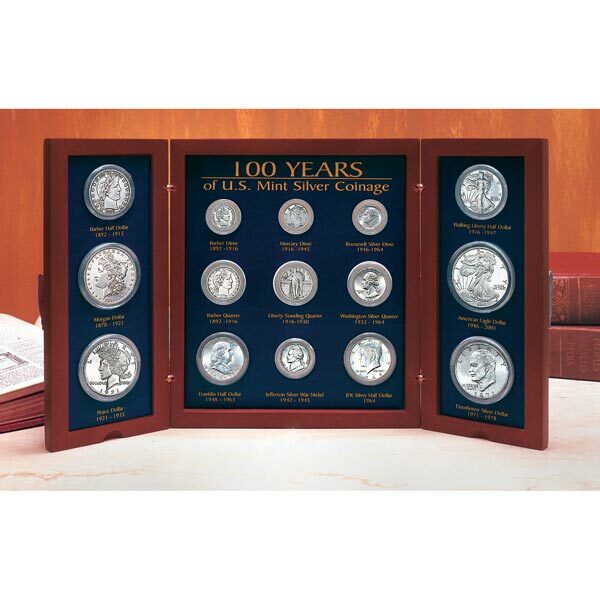 Included are the Morgan and Peace Silver Dollar, Walking Liberty and Franklin Half Dollar, Barber and Mercury Dime and the American Eagle Silver Bullion Dollar, to name only a few. Over half are more than 50 years old, and 13 are struck of .900 Fine Silver or higher. The polished cherry wood finish display case opens to an impressive 14"x 8." Allow 2-3 weeks, no rush delivery or gift box. Item can only be shipped within the Continental US.